A sneaky slap handed to former prime minister Manuel Valls who was campaigning in France's Brittany region, has been captured on tape. It’s unclear whether the attack was politically motivated. The incident occurred in the town of Lamballe, just as Valls was coming out of the local municipal offices. A group of people greeted the presidential candidate, and he proceeded to shake hands with the public. The video released by a local newspaper Le Telegramme captured the moment of the attack. 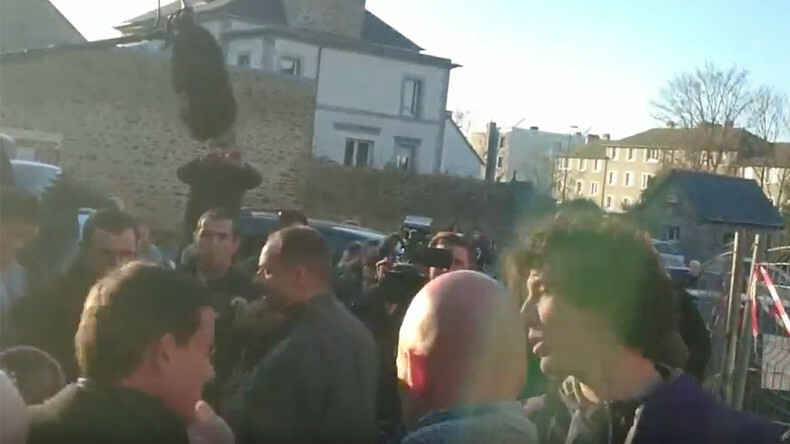 A young man first shook hands with Valls but then shouted “This is Bretagne!” and slapped the politician. The perpetrator was promptly apprehended by a security guard, who pushed him against a construction fence and to the ground. The fence was downed in the struggle as well, causing a couple of people to fall. The sly attacker, who turned out to be a local 18-year-old man, is in custody. Local prosecutors said that the perpetrator expressed “regionalist” thoughts, but it still unclear if the slap was politically motivated. “An individual who hits a politician is obviously always serious, but today that’s not what interests me in Brittany. You will always find individuals who want to prevent democracy,” Valls told local reporters.